For the first time in 2019, we invite you to a Networking Night with an additional chance to participate in our popular speed networking rounds. Here you will have the opportunity to talk to many of the other guests for 3 minutes - no time for superficiality. So prepare your pitch - promote yourself and your work, find new clients or contacts, extend your network, make friends or new business partners. 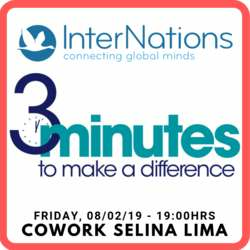 Location of the event is the BRAND NEW Co-Workplace of Selina Lima. Located in Alcanfores, a few blocks away from the Hotel Selina itself. It is a new great alternative for those who are looking for a great place to work and to network. This night you will have the chance to see the space and - with a bit of luck - even win a work desk free for one week at the CoWork. This event is ENGLISH only.